Fish is an excellent source of protein and omega-3 fatty acids. That helps in development of brain and eyes. Hence fish should be a part of healthy diet. It’s recommended that adults and even children eat fish at least once a week. 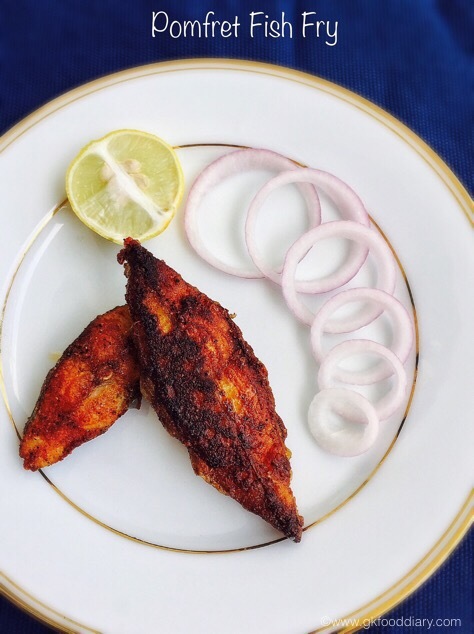 Fish fry is regular in our Sunday lunch menu. 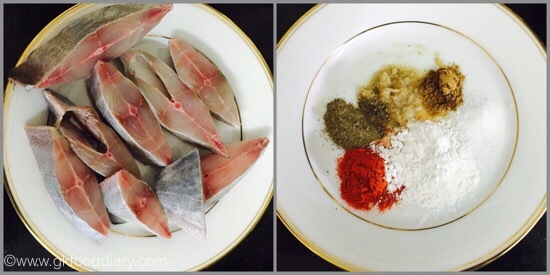 I started cooking more fish recipes as my baby loves fish. She goes crazy whenever I offer this pomfret fish fry for her. Fish can be introduced to babies after one year if there is no history of allergies in your family including asthma & food allergies. Check with your baby’s doctor about including fish in your baby’s diet. 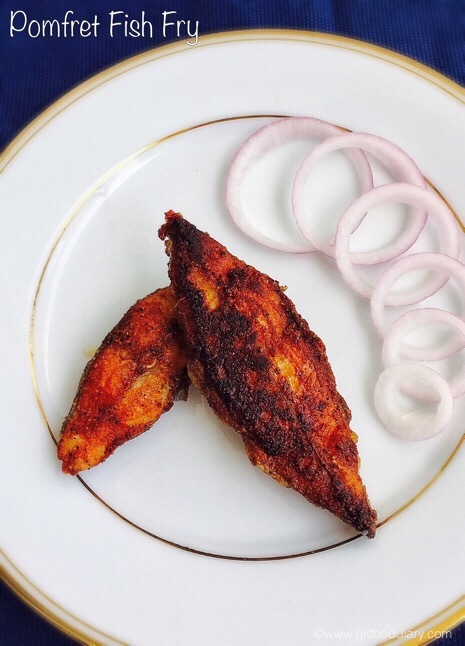 When you introduce, start with white flesh fish like pomfret as its easily digested and less allergic compared to other fish types. As with any new food follow, 3 days wait rule. 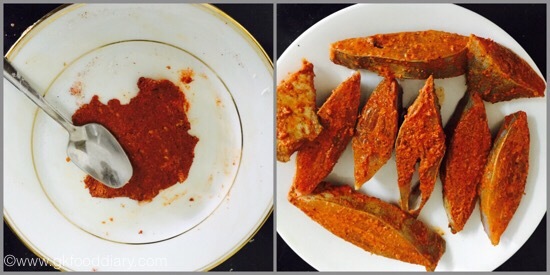 Here is how to make delicious pomfret fish fry. Clean the fish pieces and dry them thoroughly. Set aside. In a plate , take red chilli powder, pepper powder, turmeric powder, coriander powder, corn flour, ginger garlic paste and salt. Mix it well with your hand or use a spoon. Add little water if needed. Coat the fish pieces with the mix on one side well and repeat the same for other side too. Marinate the fish pieces for 30 minutes at least. I kept it in refrigerator for 2 hours. Heat oil in a pan until very hot. Then place the fish pieces carefully and fry it for 5 minutes. Then turn the fish pieces with care and cook it for 3 minutes or until done. Remove from the pan and drain off the excess oil on kitchen towel or tissue. 1. Clean the fish pieces and dry them thoroughly. Set aside. In a plate , take red chilli powder, pepper powder, turmeric powder, coriander powder, corn flour, ginger garlic paste and salt. Mix it well with your hand or use a spoon. Add little water if needed. 2. Coat the fish pieces with the mix on one side well and repeat the same for other side too. Marinate the fish pieces for 30 minutes at least. I kept it in refrigerator for 2 hours. 1. Heat oil in a pan until very hot. Then place the fish pieces carefully and fry it for 5 minutes. Then turn the fish pieces with care and cook it for 3 minutes or until done. Remove from the pan and drain off the excess oil on kitchen towel or tissue. 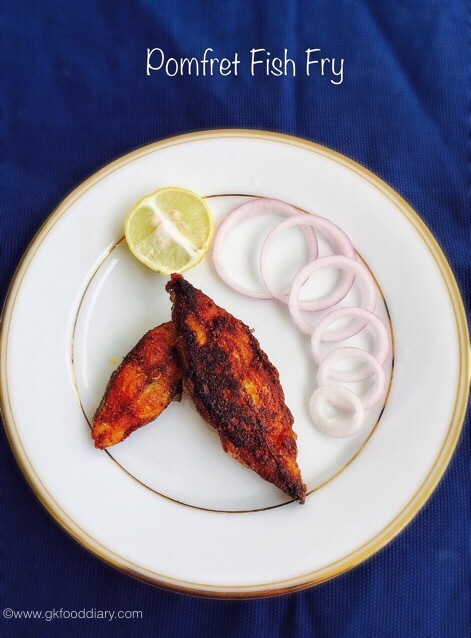 Serve the pomfret fish fry with onions, lemon or tomato sauce! Instead of shallow fry, you can deep fry the fish pieces in oil too. 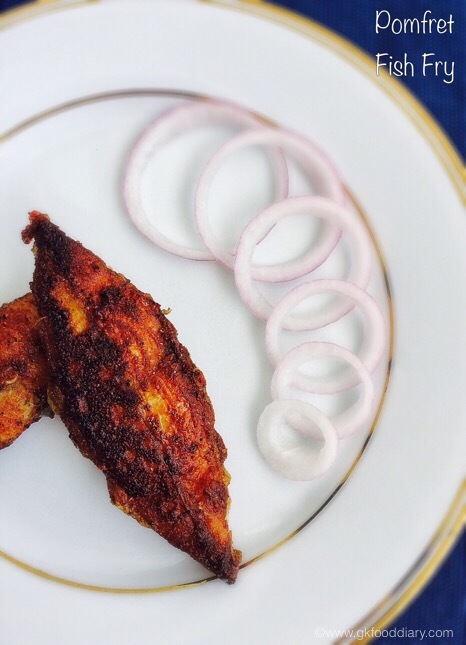 You can opt for any fish variety that suits to make fry instead of pomfret. Marination time is important for the spice powders to get attached to the fish pieces. So don’t skip it. Reduce the spices according to your preference. 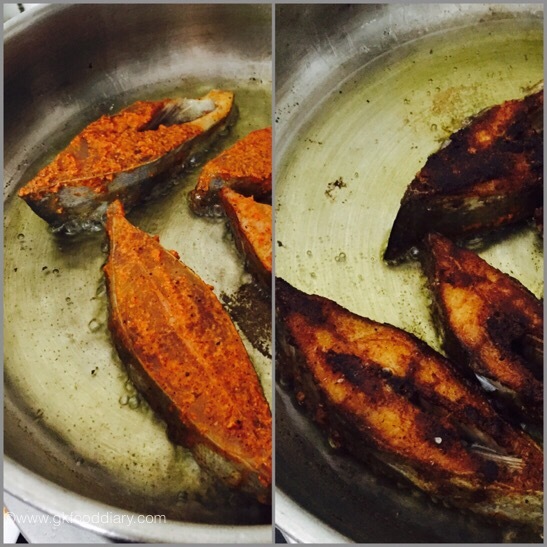 Fry the fish pieces in hot oil so that the marinade will not leave the fish.